The cluster can be an On-premise or IaaS cluster with data on local HDFS. 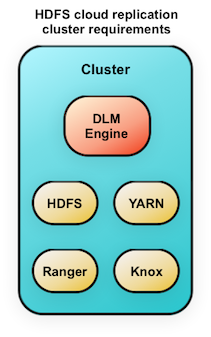 The cluster requires HDFS, YARN, Ranger, Knox and DLM Engine services. Atlas entities related to HDFS directory are replicated. If there are no HDFS path entities are present within Atlas, they are first created and then exported. The process for creating a replication job from on-premise to Google Cloud Storage is similar to creating one for on-premise to on-premise. The primary difference is that, you must register your Google cloud account credentials with DLM App instance, so that DLM can access your cloud storage.